I’ve had few chances to provide write-ups of observing sessions in 2015 due to CNY skies not agreeing with we amateur astronomers. Fortunately, Bob Piekiel’s yearly 2015 Green Lakes “Stars and S’mores” Summer Session (on the books for 6 months now) landed on an excellent summer night, providing a large crowd some excellent views of some (sadly, not all) of the Solar System’s best sights. Part of the crowd at Green Lakes. Click for a larger view. There were roughly 120 people in attendance at the start of the session (by the car/people count of the Green Lakes staff. They estimate 3.5 people per car on average, which sounds like quite a mess in the back seat), making this the largest public CNY session I’ve attended since the Transit of Venus in 2012. To Bob’s SCT and my NMT 12.5” Dob was added guest attendee and the IOTA’s own Ted Blank with his (I’m pretty sure, anyway) Orion 120mm ST Refractor. We had one last work-in-progress scope in attendance with the arrival of fellow CNYO’ers Kirk Frisch (his work-in-progress) and Chris Schuck. As usual, the setup of the scopes cut into our collective s’mores time. Bob had already aligned his SCT and started close to 8:00 p.m. on the viewing of Venus after a quick welcome and safety lecture. I had someone with great eyesight point out Venus near my scope, after which the line behind my Dob hit +50 people. 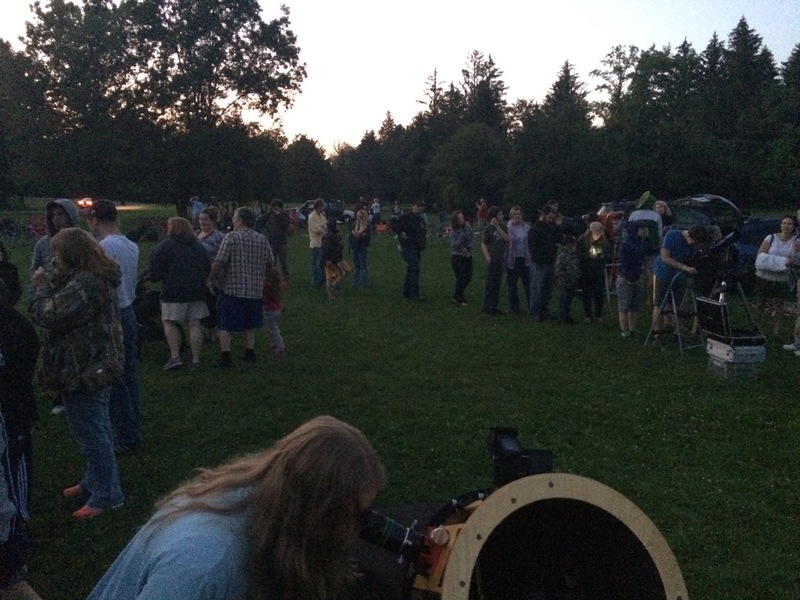 Sadly, with a +50 person line at each of the scopes and all pointed at Venus to give the attendees that view, you take quite a bit of time to show the planet to everyone (and for the motor-less scopes, additional time re-nudging Venus back into the eyepiece. Stupid Earth rotation…). For us, that meant that Jupiter, the next to appear after sunset, was already obscured in the high tree line to the West of the Green Lakes field. Bob had a short-but-heroic catch between branches, but Ted and I were left to wait for Saturn. Another search by the same woman at my scope (someone had a big piece of carrot cake earlier, I guess) pointed out Saturn midway above another high tree patch. We all then spent a good 30 minutes on Saturn, comparing views and encouraging people to spend a little time trying to pull additional detail out – namely, Titan and the Cassini Division. Finally well after sunset, the stars began to then appear behind Saturn, so person #40 had a more engaging view than person #1. * Zubeneschamali (?! Let’s go with beta Librae) in Libra – the second of the closers in my scope (at Bob’s request). Some people see this as a faintly green star, which makes it quite noteworthy (Bob and I have decided it’s actually blue-ish instead. According to wikipedia, “There seems to be no generally accepted explanation for why some observers see it as green.” Perhaps someone could do the study to see if these people also see the dress as black and blue). The Andromeda Galaxy (M31) and M32 – a final view just above the horizon (so all had to stoop low to see into the eyepiece) to take the final 5 attendees outside of the Milky Way. At the risk of starting an argument, I would argue that M31 is best viewed through 25×100 binoculars, giving you the best combination of field of view (this galaxy is six Full Moons across and any significant magnification causes you to miss lots of the trailing starlight around the core) and spiral detail. In fact, M31 is a prime reminder to all that a good pair of binos is a must-have for the dedicated observer. Those interested in some additional summertime viewing are welcome to join us at Bob Piekiel’s Baltimore Woods session this coming Friday, July 17th (18th as the weather-alternate) and solar session at Clark Reservation on Saturday. Check cnyo.org on Friday afternoon for an official announcement. We hope you can join us!